The fishing strain in River Hemsil is great and a catch limit is therefore introduced. Please read the fishing rules closely! The lower part of River Hemsil runs slowly. The river is crystal clear and thus best suited for fly-fishing. The wild Hemsil trout is shy and difficult to dupe. 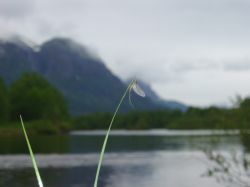 Try to find rising fish,and feel free to use a "Hemsedal’s fly" on the end of your line. The upper part of River Hemsil has alternating rapids, but quiet parts as well. Perfect for all types of angling. The large fish are even caught here. Average fish weight is 300 - 1200 g.
Update june 13 - picture from lower parts of river Hemsil - nice hatching of baetis today - and a lot of rain! Finaly some steady rising fish.